Hijacked By Twins: #CookBlogShare Week 14 Round Up - Sweet and Healthy in Equal Measures! #CookBlogShare Week 14 Round Up - Sweet and Healthy in Equal Measures! Last weeks CookBlogShare saw so many healthy recipes alongside tempting sweet treats. This made selecting a theme really quite difficult, as always you shared so many delicious recipes selecting just four was a challenge. As there was such a good mixture last week I have gone for a round up of the best of both worlds. 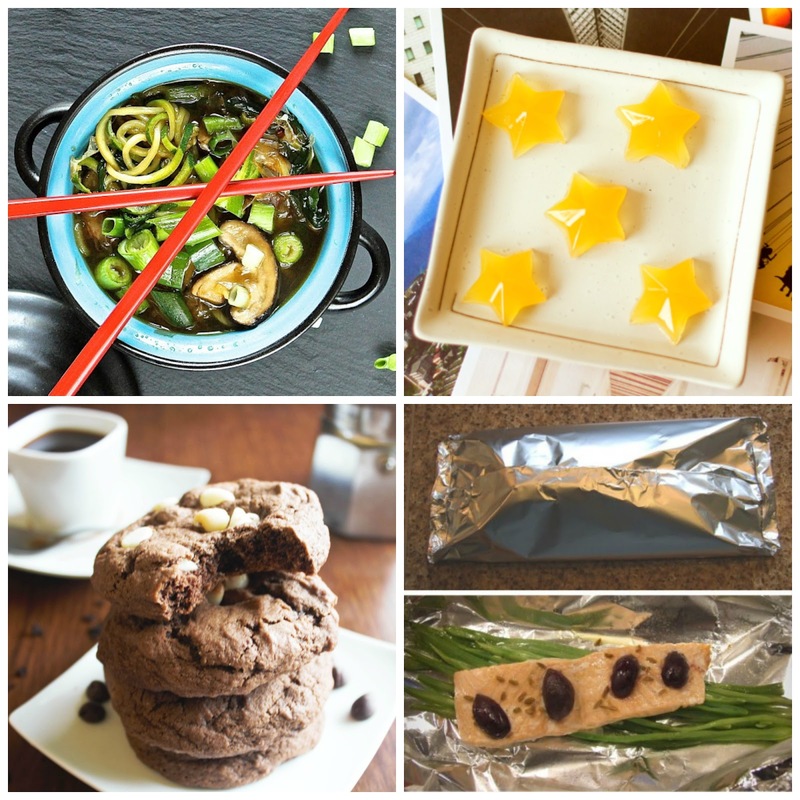 This weeks round up contains healthy recipes and sweet treats in equal measures! This should equate to a balanced diet right? Before I tell you about the four feature recipes I would like to say thank you to Mandy from Sneaky Veg for hosting last week. Mandy shared a delicious round up and also a flavoursome variant on a classic dish. If you did not read her recipe for Vegan Indian Spiced Shepherds Pie I definitely recommend you pop over and take a look. First up this week is this delicious bowl of goodness from The Gluten Free Alchemist. This Spiralized Oriental Courgette Noodle Soup is jam packed full of healthy vegetables such as courgettes, ginger and shitake mushrooms. The soup has been made using home made vegetable broth using broccoli, fennel and garlic to name just a few ingredients. I can imagine how full of flavour this soup is and it will be going on my to try list! Next up is a recipe for one of my all time favourite sweets! Now Add Sugar shared with us this recipe for homemade Pineapple Gummy Sweets using fresh pineapple juice. I have never thought of making my own gummy sweets but after reading this recipe I can definitely see me having a go! I love a good cup of espresso so when I saw Baking, and Everything's recipe for Chocolate Espresso Cookies I was immediately drawn in! They look like the perfect biscuit to have with a good coffee when the mid afternoon lull arrives! Finally is my second healthy recipe of Salmon with Olives and Runner Beans from Family Friends Food. The twinnies love olives so I know that they would love them cooked with salmon. Cooking fish in parcels is the ideal way to ensure the flavours combine together! Thank you to everyone who linked up last week and who support CookBlogShare! Thanks to all of you we have a lovely little community. This week CookBlogShare is hosted by Hayley at Snap Happy Bakes and I will be back next Monday with my regular round up. I look forward to seeing what you have been cooking up! It's been a great week for lovely recipes hasn't it! Thanks for giving my shepherd's pie a mention. Fab selection! That's got to be a balanced meal! Thank you so much for featuring my soup.